At the cross her station keeping. Christians are meant to be humble, and it is Jesus Christ Himself Who calls us to humility. Yet this crucial virtue is very illusive: as soon as we think we have it, we don’t. Yet before we despair St John also writes on how to attain true humility: Behold true, Christian humility: in this you will be able to achieve victory over every vice, by attributing to God rather than to yourself the fact that you have won. To know what humility is we must look to Christ; to know how we gain humility we again look to Christ. 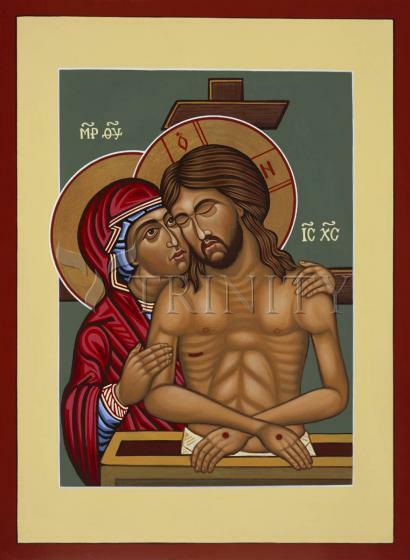 Specifically we can look to the Icon of Christ called “Extreme Humility”. This Icon shows the crucified Jesus Christ, in the tomb, usually bearing the marks of His murder and torture. Here, “extreme” means “pre-eminent” or “ultimate”. So what is “ultimate humility” according to this icon?